 Gate width is adjustable in 2 inch increments.  Two sizes cover openings from 16 to 40. 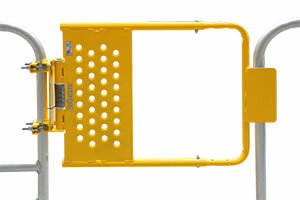  Gate fits almost any guardrail opening using the included hardware. 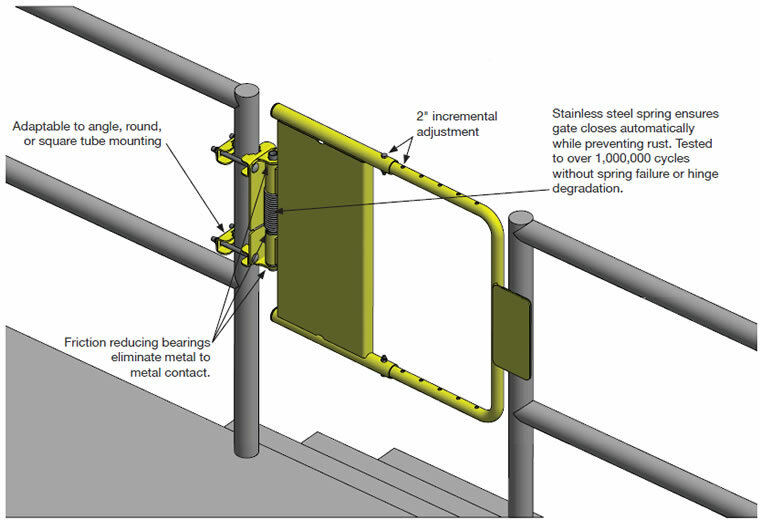 mounting surface, by simple bolt-on attachment. Up to 2" guardrails.  Left or right opening. performs extremely well in all environments for corrosion and chemical resistance.  Stainless steel closure spring will not rust and jam.  Stainless steel and Galvanized finishes also available. Safety Gate, Stair Safety Gate, Stair Safety Gates, and Swing Safety Gates from your complete source for material handling equipment.